Big Sister Shirt. This adorable high-low short sleeve top makes a great photo prop for pregnancy announcements! It features an all-over stripe print for a fun chic look. It's made of light weight jersey material for a super-soft touch and comfortable fit for your little one. We at Bump and Beyond Designs love to help you celebrate life's precious moments! 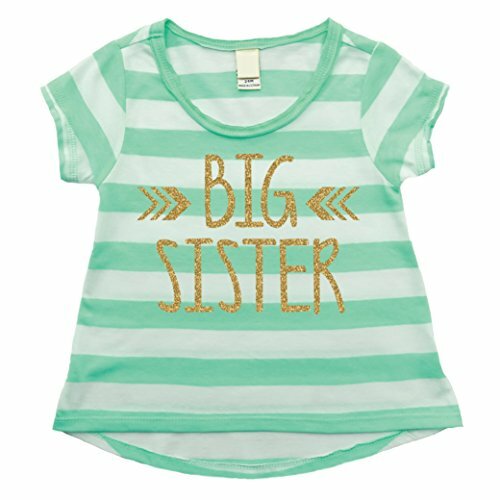 This Big Sister shirt features COMMERCIAL GRADE GLITTER VINYL, which provides exceptional durability. The glitter is embedded in the material and even after repeated washing it will not flake or peel off. Care Instructions: Wash inside out in warm water, gentle cycle, tumble or line dry. Do not iron on glitter. We hope you enjoy our selection of fun, stylish toddler girl clothes. If you have any questions about this product by Bump and Beyond Designs, contact us by completing and submitting the form below. If you are looking for a specif part number, please include it with your message.